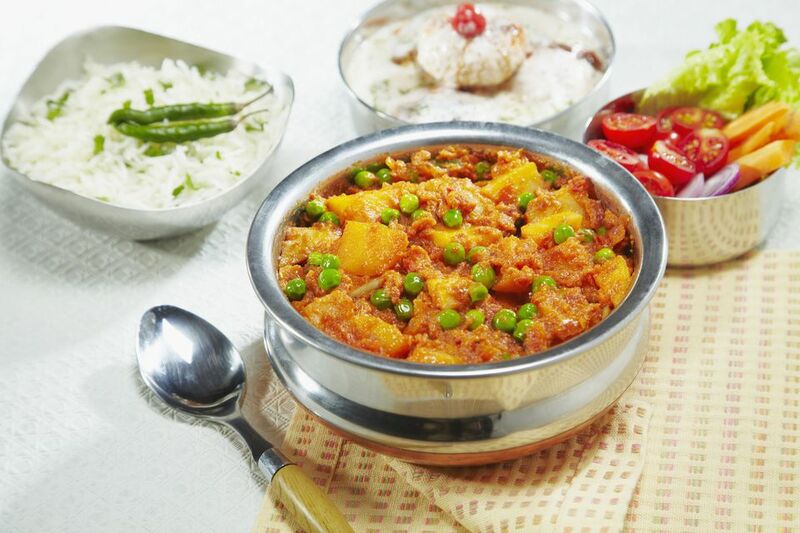 There are many different ways to prepare aloo matar, the Indian recipe for spiced potatoes (aloo) and peas (matter) in a thick tomato sauce. Originating in the Punjab region of India, the dish is made throughout the country and has a few different versions; some recipes use a coconut base, and others simmer the potatoes in a tomato sauce. This basic recipe uses a few simple spices for a flavorful and tangy Indian food dish that is naturally both vegetarian and vegan. Serve with rice and naan bread, if desired. In a large skillet over medium-high heat, heat the oil and saute the onion, garlic, and ginger for 3 to 5 minutes, or until onions are soft. Add the bay leaf, potatoes, and peas and stir to combine. Add the water. Cover and allow to cook at least 10 minutes, or until potatoes are almost softened. Add the garam masala and paprika. Cover and cook another 8 to 10 minutes. Remove from heat. Stir in the cilantro and add salt and pepper to taste. Garam (hot) masala (a mixture of spices), a ubiquitous ingredient in Indian cuisine, is a blend of ground spices that can vary a bit from region to region. Garam masala may contain spices such as cinnamon, cumin, coriander, bay leaf, cloves, peppercorns, cardamom, and mace, and no recipe is more authentic than another. One commonality, though, is that the spices are toasted before being ground. Some recipes combine the mixture with a liquid to form a paste, while others add herbs to the blend.